Gazing out the windows of the Bluebird Café in Golden BC always seems to inspire an adventure regardless of the season. The ski runs craved into the mountainside of Kicking Horse Mountain Resort stare back at me, and next to them lay the untouched goods of the seemly endless Dogtooth Mountain Range. Both bekcon me to ski them, but today the backcountry wins. My chilled hands welcome the warm cup of Fratello Coffee from the friendly barista at Bluebird and with out missing a beat she passes me a bagged lunch that is as ready as I am for a backcountry outing. Ski touring in Golden is available in every direction making it sometimes overwhelming to choose. Aside from creating a struggle for the indecisive, the options allow you to pick the area that has the best weather forecast and the most stable snowpack; options are a great thing to have when shopping for backcountry skiing objectives. We barely pass the town limits sign and we’ve already gained significant elevation from the valley. As a newb to the Golden backcountry I’m constantly in awe at all the options I see from town at in any given direction, it feels like a dream to finally be able to taste the lines I’ve quite literally window shopped. As we pull into the empty parking lot I’m not only highly caffeinated but I’m also oozing with excitement and race to get my skins on. The cold temps also put a little pep in my step to me keep moving onward and upwards! Through observation and conversations I learn that most routes into the Dogtooth Range begin with following a drainage up into a bowl and then working your way onto a ridgeline. This range seems to mimic it’s self with the north east faces being primarily steep, rocky and home to chute haven when conditions allow, while the opposite south west faces hold gentler planer slopes that lead from alpine into tree line. The headwalls connecting each ridge are generally east facing and vary from unbearably steep to friendly looking bowls. Speaking of choices, there are tons of them just with in one single range and it just so happens to be the most accessible from town. As we work our way up the treed drainage we watch for evidence of the creek that flows beneath us, but a plentiful December has created stable snow bridges that hide the water from us and allow for easy navigation as we set the skin track. We quickly arrive in a subalpine meadow that lets us take in the alpine views that still linger above us which stirs our motivation to keep ascending. As we work our way up a ridge we glance back and see the town of Golden beneath us, what a cool feeling it is to feel so disconnected from civilization and see it at the same time. We stop on route to dig a pit and check the stability of the snowpack. Our pre trip plans included investigating the snowpack and our suspected profile was confirmed as we did two isolated column tests. With a friendly snowpack under our feet we knew we would be able to ride the playful lines we had hoped! Two hours after locking the car we were on top of an alpine ridge and ready to shred! The access was a dream; quick, safe, near by – this clearly lead to anther “Golden is too good to be true moment” – I seem to have multiple of them every time I visit this gem of a town. The logistics of regrouping and skiing lines were set and it was finally time, time to ski! You know they aren’t joking when they say there is Champaign powder in BC right?! The snow was so light, fluffy and bottomless, everything snow junkie’s dreams are made of. Face shot after face shot our grins grew wider and wider. After an exchange of high fives and hollers it was time to hop back on the skin track and sneak in a few more yo-yo laps before making the final descent down to the parking lot. Golden once again delivered an amazing day, we all left giddy from an epic day of powder, gorgeous views and good company. 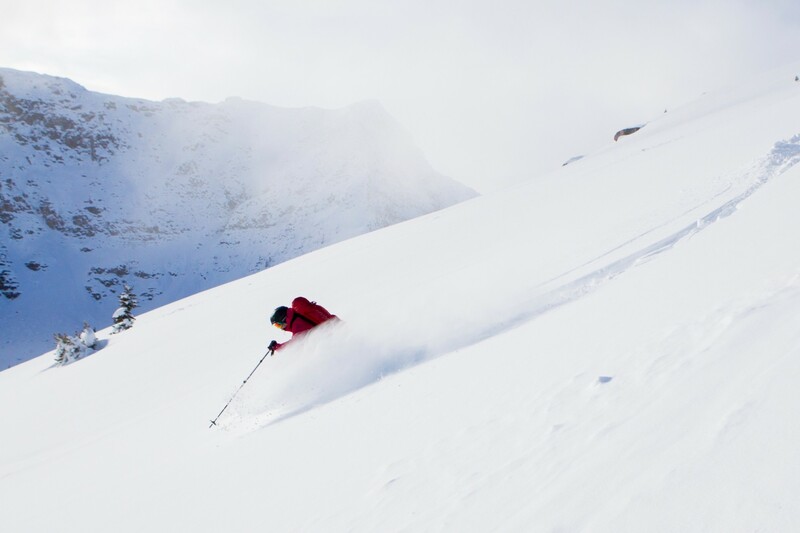 If sampling the backcountry goods of Golden are on your to-do-list, the best place to start is at Higher Ground Sports. This locally owned shop has everything you need to step foot in the backcountry from Avalanche Safety Courses, to guided backcountry expeditions of various lengths and all the gear you need to get up and down safety and comfortably. If ski touring makes you tick you’ll enjoy a whole new level of it at the footsteps of the town of Golden. The distinctly recognizable Dogtooth Range will call you in with their jagged peaks coated perfectly in white and once you’ve sampled them they will beg you to say.